Do you want to make your recipes healthier? You have finally found recipes that everyone will eat, and then you realize that they aren’t probably the healthiest...aka hash brown casserole? We all know that meal planning is hard enough on its own, never mind finding healthy recipes that you, and others that you might be cooking for will love and enjoy. Now you are thinking, "how do I make this not-so-healthy recipe, healthy?" #1: The goal to a recipe makeover is to think of finding ways to reduce fat, sugar and salt and increase fibre. Sometimes when you are evaluating a recipe you can find ways to tweak all 4 areas, and sometimes you can’t. That’s ok. Even small improvements can add up over time, so don’t discount making small changes to a recipe. It does matter! #2: When starting out never fully swap out a full ingredient for another. ...not until you are absolutely confident in its “swap-out” ability. For example, some baking recipes call for swapping out applesauce for sugar. It’s actually a really good swap technique, but you can’t always swap out the same amount of sugar in all recipes… so you have to try it out in smaller amounts first until you get a feel for its “swap-out” ability. In some muffin recipes you can fully swap out all the sugar for either mushed up bananas or applesauce, and some recipes it is better to cut it by ½ or ¾’s, but not removing all sugar. The take home message here, is that not all swap techniques work for all recipes. Try swapping out the ingredient in a test batch first, and make note of it on your recipe card. #3: Don’t get too carried away when it comes to making over recipes. Sometimes it is better to keep the recipe as is, and just have a smaller portion. Really when it comes to the enjoyability of foods, and the pleasure of taste, I would rather have a smaller regular chocolate chip cookie than having 5 horribly bland, artificially sweetened cookie creations. #4: You don’t want to always cut out all the fat in a recipe. Sometimes minimum amount of fat is needed to achieve a pleasurable taste. Reducing the amount of fat in a recipes is a better option rather than cutting it all out. #5: Shocker: replacing sugar with honey or maple syrup isn’t really a huge recipe improvement. 1 tbsp honey = 64 calories, and 1 tbsp sugar = 48 calories. Its only a 16 calorie difference, so if you are going to swap out sugar for honey, do it because you like the taste not the calorie savings. #6: Shocker: swapping out sea salt for regular salt, makes no difference in a recipe either. All salt is sodium chloride (NaCl), and it all comes from seawater — even table salt. Sodium is the main ingredient of salt. All types of salt, for example, table salt or sea salt, are high in sodium. Healthy adults only need about 1500 milligrams of sodium each day. This is the amount of sodium in 2/3 teaspoon of salt. You definitely want to decrease salt in a recipe. Sometimes I leave it out and then just let people add it when I am serving food. I find that people add salt to their meals as a habit, so if you are like this, you can leave most of the salt out of recipes and then just add it in the end. #7: Know your cooking times of whole grains. One simple way of upgrading a recipes is swapping out brown rice for white rice, or brown pasta in a white pasta recipe. However it isn’t just as simple as swapping it out. Brown rice and whole wheat pasta take longer to cook and often requires more water when preparing. 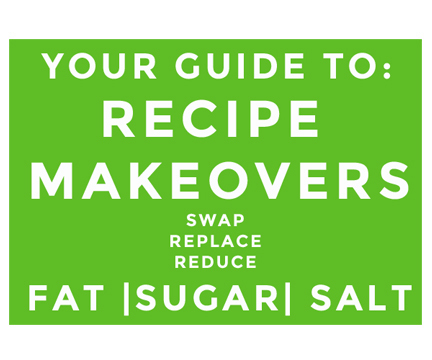 Get YOUR Complete Guide To Recipe Makeovers! Get our guide and we will let you know when we publish more meal planning tips! Ever wonder what foods you can freeze and what foods you can’t freeze? If so, you are in luck! This week on our GET MEAL PREPPED Podcast we are talking all about freezing foods for meal prep! Make sure you to take a listen. I am sure you will be surprised about what you can freeze and what you can’t freeze! In this episode Susan and Andrea review the all the foods that you can freeze and all foods that they do not recommend freezing. Or check out our live recording on You Tube! Make sure to subscribe so you get notified when we publish new episodes! GMP 001: Instant Pot -A review of one of the best meal prep tools on the market! The Get Meal Prepped show is a podcast about meal planning strategies, improving your nutrition and getting dinner on the table! I am your host Susan Watson, registered dietitian, lifestyle nutrition welmeal planning course Get Meal Prepped. If you are tired of eating like crap and not knowing what is for dinner then you have come to the right place!